https://matcha-jp.com/en/2587 Asakusa Guide: Sensoji Temple, Nakamise-dori, Tokyo Skytree and More! Japanese traditional architecture and streetscapes still remain in Asakusa, Tokyo, a town which attracts visitors from all over the world. Here is a guide to Asakusa including basic information on access and places to visit. 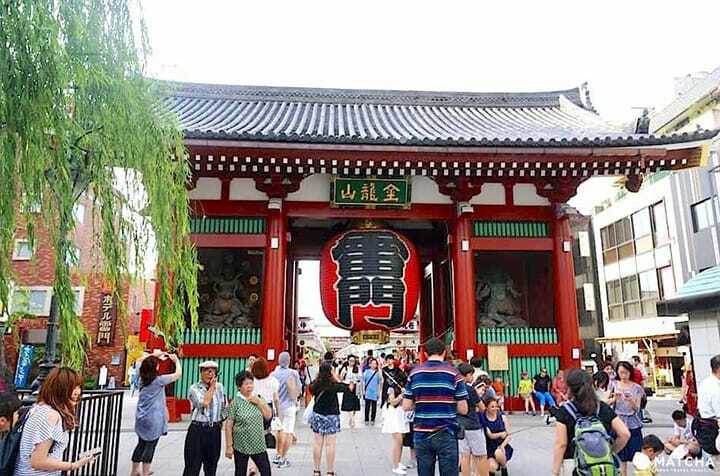 Asakusa is one of the most popular places to visit in Tokyo. You can find Sensoji Temple and other historical buildings here, as well as experience Japanese culture and purchase handicrafts. If you want to try sushi, Japanese sweets, and other dishes, Asakusa is a good place to go. You can feel a distinct Japanese atmosphere in the area once you arrive here. 5000 Yen Plan For An Asakusa Stroll - Kimono and Sake Included! Asakusa is connected to the rest of Tokyo and other prefectures by the Toei Asakusa Line, Tokyo Metro Ginza Line, Tobu Skytree Line, and the Tsukuba Express. Here are some tips for accessing Asakusa from major places in Tokyo. If you are visiting Asakusa from Narita or Haneda Airports, take the Toei Asakusa Line. It is connected with Keisei Line (Narita Airport) and Keihin Express (Haneda Airport), and some trains will take you directly to Asakusa. If you go to Asakusa directly, the fare is 1087 yen from Narita Airport to Asakusa station (85 minutes) and 614 yen from Haneda Airport (45 minutes). If you are coming to Asakusa from Shibuya or Ginza, take the Ginza Line. It will take you directly to Asakusa. From Shibuya station to Asakusa station, it costs 237 yen (33 minutes) and from Ginza station, it costs 195 yen (17 minutes). You can walk to Tokyo Skytree, Tokyo’s landmark, but you can take the train too. Tokyo Skytree station is only one station away by the Tokyo Skytree Line, which can be accessed through EKIMISE, a department store in Asakusa. From Asakusa station to Tokyo Skytree station, it costs 144 yen (2 minutes). If you are visiting Asakusa from Akihabara, take the Tsukuba Express. Please note that Asakusa station on the Tsukuba Express line is not the same as the other Asakusa station. From Akihabara station to Asakusa station, it costs 204 yen (4 minutes). Asakusa has many places where you can experience Japanese traditions and culture. Here is a selected list of 10 places to visit in Asakusa. Sensojiis a temple in the center of Asakusa. The bright red main hall and Japanese historical landscape create a truly fascinating sight. The main entrance has Kaminarimon, or“Thunder Gate”, which is known as a symbol of Asakusa. This is a great photo spot! The Hidden Treasures of Sensōji Temple: Eccentric Statues?! 2. Nakamise Shopping Street: Go Souvenir Shopping! Sensoji’s main hall and Kaminarimon are connected by the Nakamise Shopping Street. It is the oldest existing shopping street in Japan with a history spanning over 130 years. Over 90 stores line this street. The Nakamise Shopping Street not only has food stands but also souvenir shops. If you are looking for Japanese souvenirs in Asakusa, the Nakamise Shopping Street is the place you should go. Kappabashi Dougu Street is a shopping street where kitchenware and appliances to cook Japanese food are available. The quality of kitchenware is very high, which attracts cooks from all over Japan and the world seeking custom-made knives and pots. You can also find the high quality food samples that are displayed at restaurants throughout Japan here too. If you like Japanese food, you may want to take a look the kitchenware used by Japanese cooks. Asakusa Hanayashiki, opened in 1853, is the oldest amusement park in Japan. They have the oldest roller coaster in Japan and other classic rides here too. Bee Tower, one landmark in Hanayashiki, is a popular attraction. You can overlook Asakusa from above, which looks quite different from usual. Hanayashiki - Enjoy Asakusa's Retro Amusement Park! Asakusa Hanayashiki: Souvenirs to Look Out For! Azumabashi Bridge is a bridge across Sumida River near Asakusa station on the Ginza Line. The bright red color catches the attention of people passing by. Azumabashi is known as one of the best photo spots for Tokyo Skytree. If you want to take a great shot of Tokyo Skytree, this is the place to go. Marugoto Nippon is a shopping mall where products from all over Japan are available. 50 shops from different parts of Japan come together here to sell their specialty wares. There are restaurants where delicious regional cuisine can be enjoyed on the 4th floor. You can feel the charm of various Japanese regions here in Asakusa. Ekimise is a department store connected to Asakusa station on the Tokyo Skytree Line. From B1 to the 3rd Floor is a Matsuya Department store and while fashion and restaurant floors start from the 4th floor upwards. Wanoichi on the 7th floor is a great place to shop if you are looking for Japanese traditional crafts. If you are looking for a particular kind of souvenir, you should definitely stop by there. The Asakusa Culture Tourist Information Center is where information about the Asakusa area is readily available. Tourists have access to useful services including multilingual staff and free WiFi. From the viewing deck on the 8th floor, you can overlook Asakusa and Skytree. It’s a lot of fun to plan out your trip through the city while looking over it. Sumida Park is a park along Sumida River. It stretches 1.2 km long and you can see Skytree from everywhere in the park. The park is famous for its beautiful cherry blossoms during spring. If you visit Asakusa, you should take a walk in Sumida park. The Asakusa Matsuri Museum is where you can learn about festivals in Japan. Festival-related items and models of the festival are displayed in this museum. You can find a miniature model of the Sanja Festival, a traditional festival in Asakusa here. It’s a very interesting place where you can learn about Japanese traditions through festivals. Asakusa is where you can still encounter Japanese traditional culture. You can also enjoy the incredible views of both Tokyo SkyTree and Sumida river here. Visit Asakusa and experience Japanese traditions firsthand! From Asakusa to Ginza and Shibuya, Tour 7 Areas of Tokyo in 2 Days! The Best 5 Amusement Parks in Japan - Enjoy Unique Attractions!